Last weekend, I made what has now become an annual trip to Chipping Campden to watch and take part in Robert Dover’s Cotswold Olimpick Games. I’ve been intrigued by these games for many years, and have been going regularly with my family since 2009. My first trip was mainly for research purposes while I was working on The British Olympics, for which the Cotswold Olimpicks formed the starting point. Since then, it has been the event itself that has drawn us back. The Games claim a history back to the early seventeenth century, when Robert Dover, a lawyer with Catholic leanings, reinvigorated a local Whitsuntide wake. He brought in games, dances, and associated revelry, and his games soon earned the epithet ‘Olimpick’ from his well-educated friends who wanted to show off their classical knowledge like good Renaissance gents. Dover presided over the games, wearing, as a symbol of his high status, a suit of clothes passed down from King James, and the hill on which they took place soon became known as Dover’s Hill. 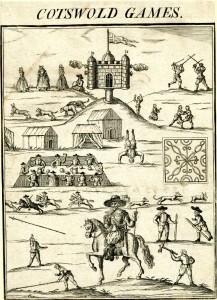 Although the Games were suppressed for their old religious trappings and their riotous natures during the Civil War and under Cromwell’s Commonwealth, they were revived under Charles II and carried on until the 1850s. Unsurprisingly, they were a bit too much for respectable Victorian tastes, and they were suppressed again, eventually resurfacing in the 1950s. Now, in 2013, the Games are still going strong, supported by the dedicated work of the Robert Dover’s Games Society. It would be easy for the Society to simply stage the Games as a re-enactment, a kind of sporty version of the Sealed Knot. 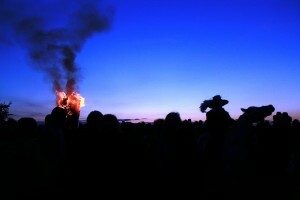 But it is doubtful if this would attract the thousands of people who come each year. Instead, the Games maintain a healthy anti-puritanical spirit, with their funfair, dancing, fireworks, and torch-lit procession, along with some entertaining and invigorating sports. There are races for children, held in the main street of Chipping Campden and on Dover’s Hill itself – indeed, my son made his Olimpick debut in the junior circuit this year. For adult runners, there is a 4.5 mile cross country race through the beautiful grounds of Campden House – I’ve written about this for the British Library. I took part again this year, for the second time, and came in, in a signally unspectacular manner, in fourteenth place out of a field of fifteen. The camaraderie between the runners is great, no-one takes it too seriously, and there are none of the trappings of regular races like vest numbers, mile markers, or microchip timing devices on our ankles. For all-rounders, there is the team-based Championship of the Hill, involving wheelbarrows, water, sacks, bales of hay, and grass skis, and resembling nothing that you would see in the Johnny-come-lately Olympic Games – rather, you should take It’s a Knockout as the template. Individuals compete for the title of Champion of the Hill, a four-part event involving throwing the hammer (a real hammer, not the ball and chain of modern athletics), putting the shot, the standing long jump, and spurring the barre (which resembles the Highland sport of caber tossing). There is a tug-of-war competition, the final of which this year involved a team of young farmers against a group of lads on a stag weekend, which has to be the perfect symbol of the Cotswold Olimpick spirit. 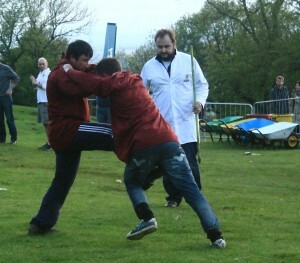 And, of course, there is the world championship in shin-kicking, a fine old game that involves exactly what it says on the tin. No ambulances were needed this year, but a couple of the players who retired hurt looked like they would not be walking properly of a good few weeks. Of course, the organisers know their history, and there are some wonderful references to the Games’ origins. The centrepiece of the arena is Dover’s Castle, a modern imitation of the structure that dominates the famous seventeenth century illustration, and cannons are still fired to ‘awake the Spirit of the Games’. The local Roman Catholic priest, Father John Brennan, dresses up as Robert Dover, and Paul Dare dresses as his friend Endymion Porter, and they start the Games by riding into the arena. The spectating arrangements remain pretty historical, too. You have to take your chance with a spot on the steep hillside above the arena, contending with sheep-droppings, mole hills, nettles, and thistles, and hope that you don’t slide down into the range of the shin kickers. 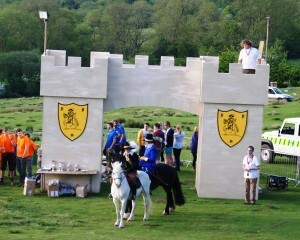 The Cotswold Olimpicks remain a vibrant and entertaining event in the calendar of their community. 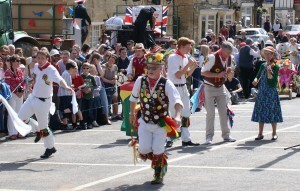 With the Merrie England of the Scuttlebrook Wake the next day, involving a fancy dress parade, the crowning of the Scuttlebrook Queen, maypole dancing by local school children, and more ribald dancing by the Campden Morris, you could easily lose yourself in history. It remains one of my favourite weekends of the year, and a wonderful reminder of the deep roots of modern sport in what Richard Holt called ‘old ways of playing’.